Once again, Montana hunting seasons and elections cross paths. Candidates brag their outdoor credentials with photos of them wearing hunter orange afield on the hunt, or holding glistening trout snatched from the water with a fly rod. Yet, as the saying goes, the proof’s in the pudding. Senator Jon Tester has demonstrated his commitment to Montana’s outdoor heritage from the time he served in our state legislature. As our US Senator, Jon has been involved in numerous critical issues, supporting and initiating bills to ensure the long- term sustainability of Montana’s legacy of public lands and access, the conservation of critical resources and supporting the outdoor economy that helps our state to thrive. He has a proven track record in the Senate for advocacy on behalf of legislation that preserves, protects and enhances the resources that make Montana unique- the Last Best Place. He’s done this through efforts on behalf of such important programs as the Land and Water Conservation Fund, a program that has benefitted Montana, Montanans-and the nation- since its inception in the 1960’s. Jon’s opponent has repeatedly shown his lack of understanding of the spectacular resources that make our state unique and the outdoor values that we Montanans hold dear. Time and again, in his roles as state legislator and on the State Land Board, and despite widespread support throughout Montana’s hunting, angling, recreation, and conservation communities, he has stood opposed to important initiatives that ensure our hunting and outdoor heritage into the future. Instead, he has chosen to ally himself with those who would put public lands, resources and access in private hands, far from the reach of ordinary Montanans. There is no question that Jon Tester embraces-- and more importantly, demonstrates through his actions-- a strong habitat conservation ethic, and an articulated commitment to and support for our publicly- held resources, public lands and public access to them. 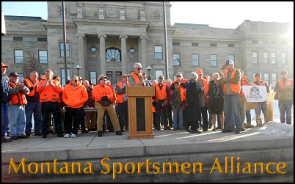 The Montana Sportsmen Alliance Pac gives Jon our unqualified support for United States senator on November 6.